I KNOW ITS HARD MAMA. I KNOW IT CAN BE HARD TO GET UP EVERY - ProudMummy.com the Web's Community for Mums. I KNOW IT'S HARD MAMA. I KNOW IT CAN BE HARD TO GET UP EVERY DAY AND HAVE THESE LITTLE PEOPLE RELY ON YOU. I KNOW IT'S HARD TO FEEL LIKE SOMETIMES YOUR WORLD IS SO SMALL. I WANT TO REMIND YOU, YOU ARE THE WORLD. YOU ARE THE WORLD THAT THOSE LITTLE ONES REVOLVE AROUND. YOU ARE THEIR NURTURE, THEIR HOME, AND THEIR COMFORT. 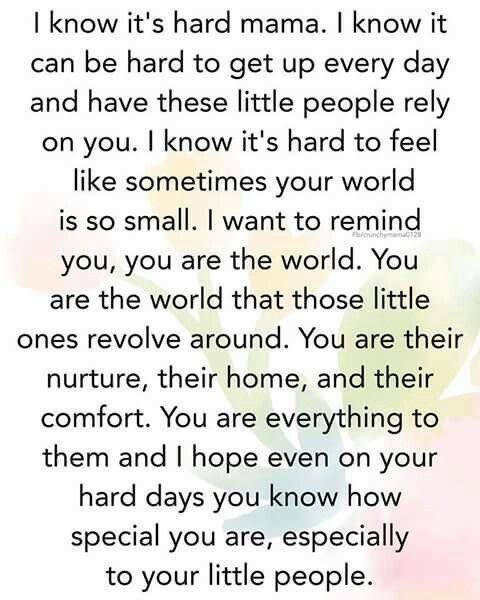 YOU ARE EVERYTHING TO THEM AND I HOPE EVEN ON YOUR HARD DAYS YOU KNOW HOW SPECIAL YOU ARE, ESPECIALLY TO YOUR LITTLE PEOPLE.